Once you've applied and been approved as a borrower, taking a trip with Car Next Door is simple. To book, just visit the search page or download the app, search for available cars that match your needs, and book instantly. You don't need to wait for the owner to confirm. Your trip can be as short as an hour, and increase in increments of 15 mins for up to 60 days. Log in to the mobile site or app 15 minutes before your trip starts. We’ll walk you step-by-step through your whole trip. Remember, you are a guest in a real person’s car. Please take care of it as you would for a friend. Only you or other approved Car Next Door members may drive the car. Other drivers are not insured. Don’t smoke in the car. If you or a passenger smokes, close all the doors and windows and go at least 10 metres away before lighting up. Return the car clean and tidy, ready for the next driver. If anything goes wrong, let the owner know - don’t wait for them to discover damage, spills or fines themselves. The keys for the car are secured in a lockbox. It may be on the car’s window, or attached to a fence or building nearby. You’ll get the exact location, and a code to open the lockbox, 15 minutes before your trip starts. If the lockbox is on the car's window, take it off and store it safely in the car while you drive. You’ll need to meet the owner to pick up the keys. The app will give you instructions to get in touch with the owner and arrange to meet. The owner will be able to let you know where the car is currently parked. Before you drive, do a quick check of the car. If the car is not in good condition, is dirty or has less than ¼ tank of fuel, take a photo of it and let us know. Take photos of all surfaces of the car and the car's interior and upload them through the app or website. You will take photos again when you return the car. If you can't upload the photos as you take them, make sure you upload them within 48 hours of your trip ending. Your photos protect you. If damage is found later, and your before and after photos show that it was not caused during your trip, you won’t be held responsible. Each Car Next Door is unique. The car owner’s instructions will tell you any tips and tricks for using their car. You’ll get the owner’s contact details in case you need to ask them a question. If you're borrowing a Key Handover car: enter the current odometer reading and upload a photo of the dash showing the odometer before you drive. You must return the car with the fuel tank at least ¼ full, so the next driver can get on their way. The car’s instructions tell you what type of fuel to use. You don’t pay for fuel yourself - it is included in the distance charge. If you need to fill up, pay for fuel using your own money and upload a photo of the receipt for reimbursement. It’s simple to extend your trip through the app or mobile site, as long as no-one else has booked the car. Just follow the prompts to set a new end time. Make sure you extend before the trip is due to end, to avoid late fees. If you return the car early, you’ll still pay for the time you booked, unless someone else books it. This is because the owner may have made plans around your booking, and missed the chance to rent the car to someone else. Check the owner’s instructions for parking the car. Some cars have a dedicated park, like a garage or driveway. Others are parked on the street. In very busy areas, you may need to plan extra time to find a park at the end of your trip. If the car is parked on the street, check the instructions and parking signs very carefully. If you leave a car in a place where it gets a parking fine - no matter how long after your trip ends - you’ll need to pay the fine. If you're borrowing a Key Handover car: Enter the final odometer reading and upload another photo of the dash showing the odometer (Key Handover cars only). Take another set of photos clearly showing all surfaces of the car and the car's interior, and upload them through the app or website. Check that you've taken all your belongings with you and left the car clean and with at least ¼ tank of fuel. Use the app or mobile site to generate a lockbox code, put the key back inside and close the lockbox securely. If the lockbox was on the car's window, make sure you put it back in place. Hit the 'end trip' button to complete your booking and you're all done! 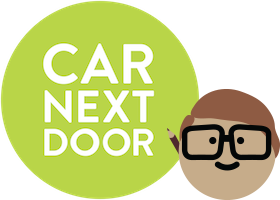 You can join Car Next Door and become an approved member for free. Once you're an approved member you'll be able to borrow from our fleet of over 1500 cars, vans and utes across Australia. It only takes a few minutes to apply and you can be on the road today.